The first 18-gauge glove with EN Level 3 cut protection, and EN Level 3 abrasion protection for extended glove life. Dyneema® Diamond Technology fibre and a thin PU coating bring a new degree of dexterity and tactility for applications with cut risks. An ultralight fabric and tailored fit, including D3 Pinky Knitting, create a sensation of bare hand contact. The soft ultralight-duty seamless liner breathes to keep hands cool and dry, and offers enhanced flexibility and fingertip sensitivity with superior comfort Comprehensive 6-11 sizing ensures optimum fit and comfort for every worker. 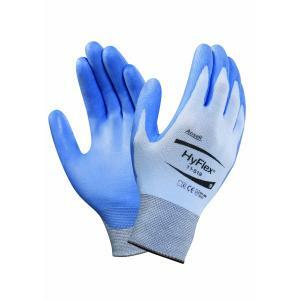 In field trials the HyFlex® 11-518 was preferred by nearly 70% of workers over thicker gloves, a preference that correlates with compliance.